The Commons Area consists of ten residence halls surrounding the Commons building, the largest campus dining hall. Five of these - Bray, Cary, Crockett, Hall, and Nason - are all 3 story, co-ed buildings and house Freshmen. Most students live in double (two-person) rooms, with a few triple (three-person) and single (one-person) rooms available. 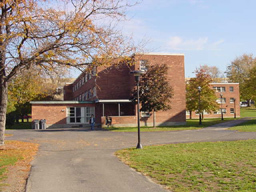 Bray Hall and Cary Hall were renovated during the 2002 summer. Hall Hall, Crockett Hall and Nason Hall were renovated during the summer of 2003.